Palm Springs’s Modernism Week, the desert city’s celebration of its modernist architecture, has just concluded a ten-day run. Founded in 2006, it typically features tours to the city’s iconic post-World War II modern homes and occasional commercial or institutional buildings, making it the most important event of its kind in the United States. In addition, it typically highlights a single important building every year, such as last year when it featured its Architecture Museum (a Marmol Radziner–designed renovation of the 1961 Savings and Loan building by E. Stewart Williams ), William Kriesel’s all-steel house tract development, and Sunnylands (the A. Quincy Jones–designed single bedroom mansion for the Annenberg family surrounded by a private 9-hole golf course). This year it highlighted the life and work of the architect John Lautner who designed the Elrod House in Palm Springs and a small motel now called The Lautner just down the road in Desert Hot Springs. It was only four years ago that architecture historian Jean-Louis Chen told a large Modernism Week crowd that Lautner hated the sober lines of the city’s midcentury modern architecture. 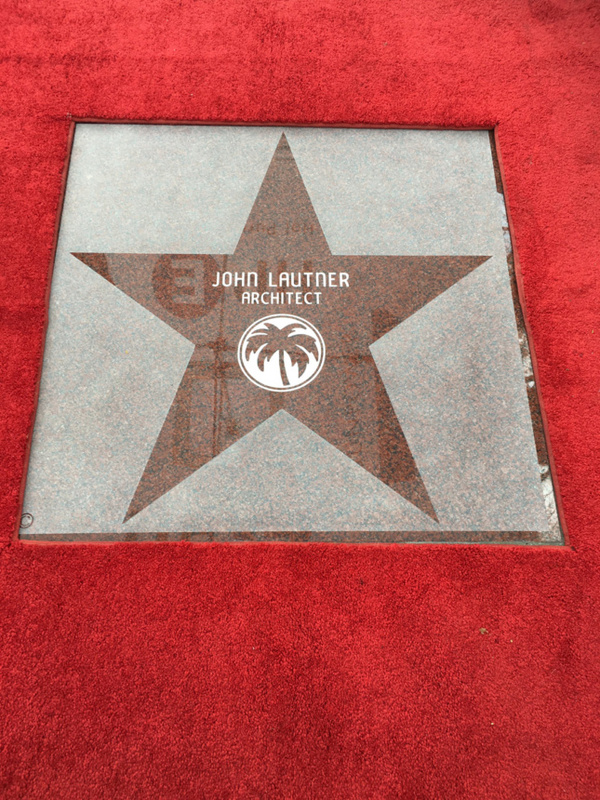 But this year Lautner was memorialized, in true Southern California fashion, with his own ‘Star’ embedded in the sidewalk of Palm Canyon Drive, the city’s main thoroughfare. 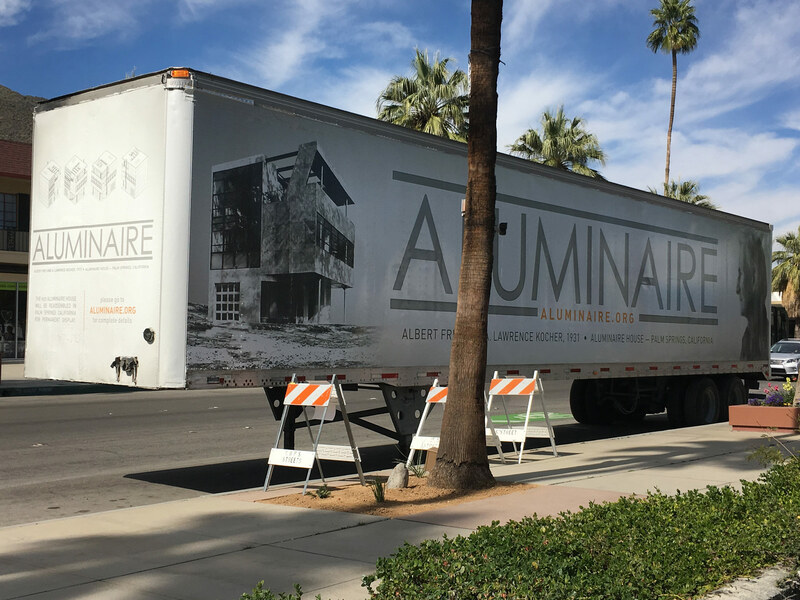 In addition, this year Modernism Week programmed a series of events around the arrival of Albert Frey’s 1931 Aluminaire House, which was transported from its home on Long Island to the dry desert air of the Coachella Valley. The flat-packed house sat all week on Palm Canyon Drive (next to Lautner’s star) in a large truck but will be resurrected on a city-owned site in the next twelve months. The organizers of Modernism Week also program lectures and presentations and this year I served on a panel Preservation Power Houses, Who, What, Why of Preservation and the Forces that Make it Happen. The panel featured many of California’s most important advocates and administrators responsible for the preservation of the state landmarks. The panel discussed the current state of preservation in California, current legislation affecting listing, and concluded with a discussion on how we might move preservation beyond highlighting only distinguished landmarks to saving structures and complexes that create the texture of neighborhoods. This might include, for example, California’s unique post-World War II typology of public schools. These stick-and-plaster built complexes, typically with breezeway arms of classrooms, spread from a central core out to large playgrounds. They arose out of the state’s unique Mediterranean climate and the demand created by a population explosion in the 1950s. These schools represent an era when public education was promoted through modern architecture and they still define the progressive modernism of the state. It was an optimistic ending to the topic of preservation and the event had a large and enthusiastic audience interested in preserving modern architecture. 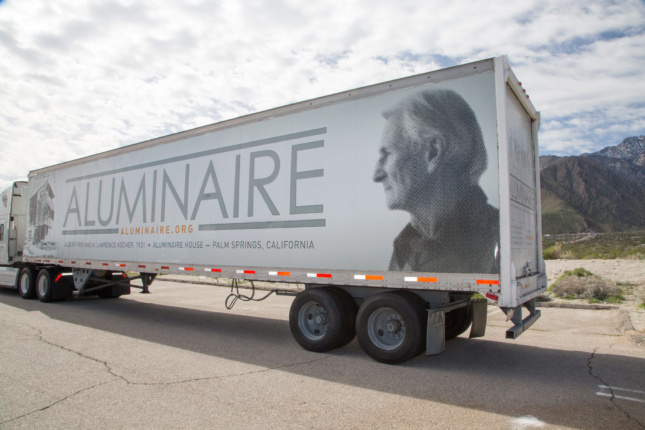 Modernism Week always seems to attract to the desert a passionate and devoted audience that appreciates architecture and design and this year was no different. Finally, I visited Desert Palisades, a new development in an extraordinary 112-acre lunar-like landscape of boulders, located at the bottom of Chino Canyon. It will eventually accommodate 113 homes but opened with its first two houses by architects Lance O’Donnell and Case Studies architect Al Beadle; we will report on this development in a later article. 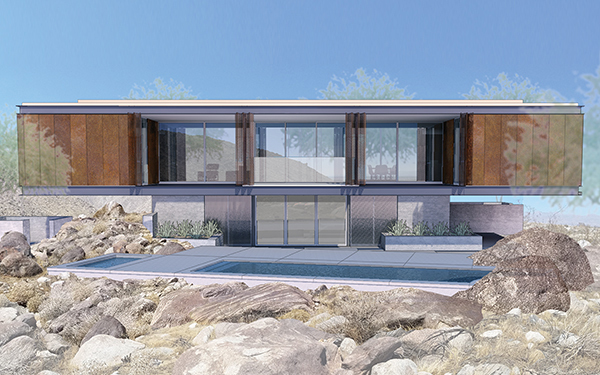 The Palisades development is also the site of the first sculpture by artist Doug Aitken for the newly launched Desert X program of sculptures that embrace and celebrate the landscape and human issues of the desert. The Atkins piece is a domestic structure (not habitable) that will eventually be covered entirely with a glass-like surface meant to reflect the surrounding landscape back to the viewer. Last week it was only a frame structure that looked as if it were being blown away by strong desert winds. Desert X organizers claim it will consider the desert as not just a natural landscape but also a social construct of preconceived notions and real estate development. The sculptures will be installed over the next few months and will feature the structure when they are completed.